"The body of Krsna, the ocean of the eternal beauty of youth, can be seen to move in waves of beauty. There is a whirlwind at the sound of His flute, and those waves and that whirlwind make the hearts of the gopis flutter like dry leaves on trees, and when those leaves fall down at Krsna's lotus feet, they can never rise up again. There is no beauty to compare with Krsna's, for no one possesses beauty greater than or equal to His. 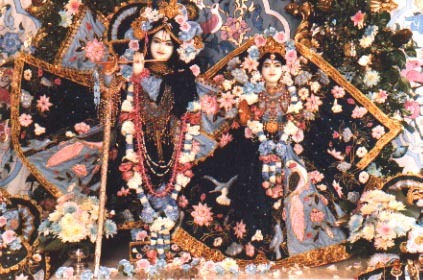 Since He is the origin of all incarnations, including the form of Narayana, the goddess of fortune, who is a constant companion of Narayana, gives up Narayana's association and engages herself in penance in order to gain the association of Krsna. Such is the greatness of the superexcellent beauty of Krsna, the everlasting mine of all beauty. It is from that beauty that all beautiful things emanate."